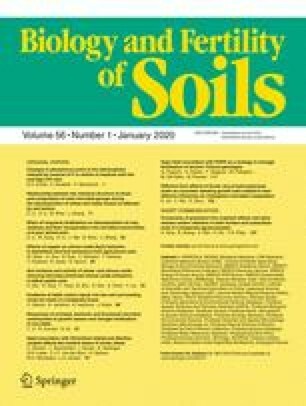 Intracellular arbuscular mycorrhizal (AM) colonization was compared between nitrogen (NH4NO3) fertilized (10 g N m−2) and nonfertilized tallgrass prairie plots. In the microscopic analyses of host roots, only intracellular coils showed an increasing trend as a result of N fertilization, whereas intracellular colonization by arbuscules, hyphae, or vesicles did not differ between the N treatments. Clone libraries established from pooled PCR products of AM fungi contained exclusively species of Glomus; no other genera were detected indicating that Glomus spp. dominated the host roots. Comparisons between observed and random topologies indicated that cloned sequence placement covaried with N treatment: unique clades within Glomus originated exclusively from N-fertilized or nonfertilized treatments. We conclude that the communities of dominant and most commonly occurring AM fungi changed in response to N amendment, although the root colonization showed minimal or no response.